Is Joseph Kony No Longer a Threat to East Africans? 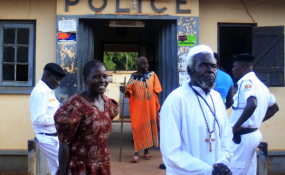 Severino Lukoya, right, the father of the late Alice Lakwena, the commander of the Holy Spirit Movement rebel outfit, walks out of Gulu Central Police Station last year. Gulu — Civil society organisations in Acholi and Lango sub-regions have accused the International Criminal Court (ICC) of being selective in apprehending perpetrators of the different civil wars in the two regions. In ensuring justice for the victims of the atrocities caused by the perpetrators of these wars, the activists argue that Mr Severino Lukoya, the father of the late Alice Lakwena, the founder of the Holy Spirit Movement, should be apprehended. Lakwena's rebel movement saw several people lose their lives as she waged war against President Museveni's government in 1986. The activists argue that Mr Lukoya, 91, was very instrumental in offering technical support and advice in the two separate insurgencies of the Holy Spirit Movement and the Lord's Resistance Army (LRA) led by Joseph Kony. Although the Holy Spirit Movement (1980 to 1985) was led by late Lakwena, Mr Lukoya is widely believed to be its architect. It is also believed that the "spirits" were later taken up by Kony, who lead a two-decade war that devastated northern Uganda allegedly with close guidance and counsel of Mr Lukoya. Mr Lukoya, also the head of the New Jerusalem Tabernacle Ministries Church that has its base in Gulu District, is accused of fathering a religion whose particular doctrines contravenes the Uganda Constitution and the Bible. According to Fr Ponsiano Okalo, the clinical director for Centre for Children in Vulnerable Situations, masterminding the two wars and fathering a cult religion that has confused the sub-region is ground enough to have Mr Lukoya investigated and tried by the ICC. "My concern is about the genesis of this war. I am wondering why such a man who masterminded these civil wars is left to confuse many people and the ICC just ignores him," Fr Okalo said. Fr Okalo made the remarks during a meeting with a team from ICC, civil society organisations and the media recently. This was during a dialogue to update the locals on the ongoing proceedings at The Hague, in The Netherlands as far as Dominic Ongwen's trial is concerned. Ongwen, LRA's former commander of the Sinia Brigade, is facing more than 70 charges of crimes against humanity. He tasked the ICC to explain how they came to conclude the LRA trial list that consisted of five top LRA commanders and how Mr Lukoya was left out. The vice chairman of Acholi Religious Leaders' Peace Initiative, Sheikh Musa Khalil, said Mr Lukoya's role in the two wars needs to be investigated. "Mzee Lukoya's role in the war has been very clear, he even led his own rebellion in Lamwo areas in which many lost their lives, let alone the cultic sect that he currently leads," Sheikh Khalil said. Sheikh Khalil, also the Acholi District Kadhi, said Mr Lukoya's actions may still cause problems to Acholi people even in the future, despite being granted amnesty by government. However, Mr Ambrose Olaa, the prime minister of Acholi chiefdom, said demands by civil society bodies to investigate Mr Lukoya will only confuse the people of Acholi more. "Apportioning blame will disrupt the little peace we have built now because it is difficult to say what Mr Lukoya's role was in the wars," Mr Olaa said. On Mr Lukoya's sect, the prime minister said it should be left to government to investigate him. However, Mr Paul Benjamin Bradfield, a senior legal officer at the ICC, said Mr Lukoya can only be tried on condition that there are witnesses and evidences to pin him. He added that they cannot prosecute someone over attacks that he personally didn't participate in or command. Responding to the calls to have him tried over his daughter's alleged atrocities and those of LRA, Mr Lukoya accused leaders in the region of blackmail, arguing that the leaders are only stopping him from preaching the word of God. Thousands of people lost their lives and more than 1.5 million driven into internally displaced people's camps during the two-decade LRA war. In 2010, Mr Lukoya was awarded Shs10m in compensation by Justice Remmy Kasule, then Gulu resident judge. The compensation arose from damages when the then Gulu Resident District Commissioner, Mr Santos Lapolo, beat him up at Kalongo Trading Centre where he was preaching the gospel under his New Jerusalem Tabernacle Ministries.